Ruby never asked for the abilities that almost cost her her life. Now she must call upon them on a daily basis, leading dangerous missions to bring down a corrupt government and breaking into the minds of her enemies. Other kids in the Children’s League call Ruby “Leader,” but she knows what she really is: a monster. This book went by in a flash. Honestly, there was so much forward movement and progression that I didn't even consider stopping to think about the book at all. At least not until that little break in the middle when I had to make myself go to sleep. This was very much the same exact experience I had when I read the first book, The Darkest Minds. I enjoyed the same things from both of these books: character interaction, character bonding, makeshift family coming together to save the world, fast-paced action, exciting adrenaline rush, and an adventure-like story-line. Except, since I had gotten to know the characters from the first book already, there may have been a bit more of an emotional impact. I may have had a few moments of "the feels" when Ruby and Chubs had their reunion. I may have smirked a bit when Vida turned out to be "part of the team" rather than just "that jealous girl who wants to be the leader." And when Jude, for the nth time, is the one to welcome Ruby "home" with a smile and a tackling embrace, I might have had some "feels" there too. 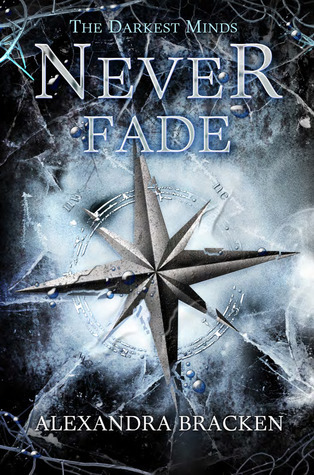 Just like the first book, Never Fade is very much a character driven story. Honestly, without Ruby and her Scooby gang, I don't know if I would be so in like with this book with the same enthusiasm. Sure, we get a deeper look into the heart of this dystopian conspiracy now that Ruby has joined the Childrens' League--more politics and whatnot going to work here. Frankly, those parts were kind of boring for me; informative, but lackluster at the same time. What I enjoyed actually came in the moment that Ruby broke out of the League's HQ, dragging Jude with her, to head across the country in order to find Liam. And then along the way, she is joined by Vida and reunites with Chubs. A whole new rag tag gang is formed with these four--SO MUCH LOVE FOR THAT! It was at that point that the story actually started getting exciting for me. I mean, don't get me wrong, I enjoyed bits and pieces of seeing Ruby's life in the League as well. It just wasn't as much fun. The character bonding in this book is winning (just as much as it was from the first book). The hopeless romantic in me is still rooting for Liam and Ruby to be together; their romance was set up pretty subtly and well, and even though it took a bit of a back seat in this book, it still managed to hang around with quite the intense punch. I'll admit that there are always choices and decisions made by characters that don't sit well with me and there are also reactions to those choices by characters that also don't sit well with me. And Liam and Ruby's relationship teeters on those lines that had me feeling a bit uncomfortable for the both of them. Nonetheless, I do still love them and hope that there will be a good conclusion for them when the last book rolls around. But while I'm a hopeless romantic and am rooting for Liam and Ruby to have a heartwarming ending, I'm also a bigger fan of the Ruby and Chubs friendship now that it's more developed and they've gone through so much to still maintain their friendship. I love that they care about each other and have this weird understanding of each other's thoughts; but at the same time, they're pretty harshly honest with one another as well. I can't get enough of these two, just watching them do what they do as friends who have been through suspicion and hate and love and... well, they're like all the family that they lost during the "apocalyptic" parts of the story line. Even when these two are fighting with each other, it's still kind of heartwarming... cause then they hug and make-up and everything feels right in the world again. And THEN there's also the love/hate bickering between Vida and Ruby; the love/hate bickering between Vida and Chubs; the adorable sunshine that is Jude (whom I kept picturing as a twelve-year old boy even though it's made clear that he's fifteen and has hit his growth spurt); and that strange new connection that Ruby now has with Liam's brother Cole. I'm just saying, there are some really nice character dynamics going on here and I DO really like what's going on. Let's just say that it was a bit... disjointed. On top of that... well, I understand the "BANG!" impact that the the author was probably going for in the end, but I'm not sure I liked it all too much. It felt too abrupt and kind of forces a bridging onto the next (and maybe last) book of this series. The first book ended with less of a bang with a more "finalized" feel to that part of the series. You knew that there was more to the story, but you didn't feel like you were missing something--if that makes any sense. It's not that I completely dislike cliffhangers... it's just that, sometimes I want to take and dangle an author by the toes over a cliff above shark-infested waters for making me hang at the edge of my own cliff for a whole entire year because the ending of the book was so abrupt and obviously prepared to dive into the next book with heart-wrenching, adrenaline-boosting "I need to read the next book right now" intensity. Nonetheless, we've got a little more than a year until the next book is released, and I'm definitely looking forward to seeing what's coming up. I especially look forward to seeing more of our characters together, now that old friends have reunited and new friendships have formed. I wouldn't call Never Fade a perfect book nor a terrible book for it's standards. The series itself is quite enjoyable. But I DID like The Darkest Minds a bit more, and to be honest, again, if not for the character interactions, this series would probably just be like every other YA trendy dystopian out there garnering attention right now. I'm not complaining since I'm thoroughly into it.